So excited to celebrate Fiesta De Mayo at the Ocean Walk in Daytona with Black Crow Events! Hope you can come!! Kids Zone – Fiesta themed crafts, piñatas, and games for the kids! Live Music – Performance by Louisiana Steve and Friends in the courtyard! on the first level of Ocean Walk Shoppes. margarita in exchange for your tickets. Complete all stops and vote for your favorite by 10pm! 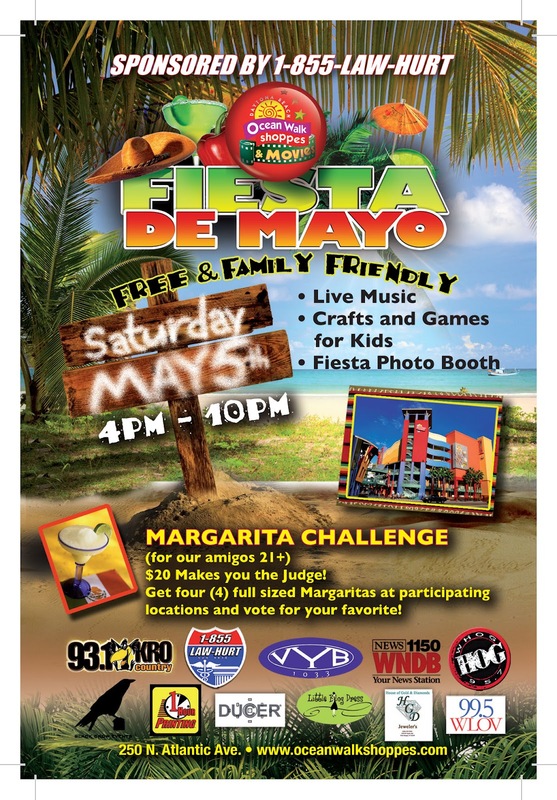 Fill out the ballot at the bottom of your lanyard and bring it back to the Fiesta De Mayo Registration Kiosk in the courtyard located on the first level of Ocean Walk Shoppes. Must be 21+ to participate in the Margarita Challenge (id required), tickets will not be available for purchase prior to the event.